In the middle of North America is a huge area of land which was once covered with grasses and colorful wild flowers. The French called the rolling plains of grass "prairie", from the word for a meadow grazed by cattle. The prairies are a type of grassland dominated by herbaceous plants and grasses. Very few trees grow on the prairies and are usually widely scattered. The prairies form a triangular area from Alberta, Saskatchewan, and Manitoba down through the Great Plains to southern Texas and Mexico, and approximately 1,000 miles from western Indiana westward to the Rocky Mountains. They cover about 1.4 million square miles. As you move from east to west, the rainfall in the prairies decreases. Climates are more moist close to the mountains and to the east and north; they are driest in the central portions. This creates different types of prairies, with the tallgrass prairie, known as the true prairie, in the wetter parts. Grasses such as big bluestem, and Indian grass, and many species of flowers grow here. The plants can sometimes grow to be 10 feet tall. Mixed-grass prairies are found in the central Great Plains, and shortgrass prairie towards the rain shadow of the Rocky Mountains. The rain shadow causes Pacific ocean moisture to rise and cool, dropping as rain or snow on the western side of the mountains instead of on the prairies. Precipitation in the prairies can reach from about 12.6 inches in the shortgrass prairie to 21.7 inches in the tallgrass prairies. The prairies were maintained in their natural state by climate, grazing and fire. Rainfall varies from year to year in the prairies. There is usually a long dry period during the summer months. Every 30 years or so there is a long drought period which lasts for several years. The most famous drought was in the 1930s, when the prairies were called the "Dust Bowl". The climate of the prairies is influenced by its mid-continental location, and the sheltering effect of the Rocky Mountains. Being located far from the moderating effects of oceans causes a wide range of temperatures, with hot summers and cold winters. Strong winds blow across the endless plains during both summer and winter. Every one to five years fire would spread across any given area of land. These fires moved rapidly across the land and did not penetrate into the soil very far. They killed most saplings, and removed the thatch of dead grasses, allowing early flowering spring species to grow. Prairie plants have adapted to fires by growing underground storage structures, and having their growth points slightly below ground surface. The soil under a prairie is a dense mat of tangled roots, rhizomes, bulbs, and rootstock. The plants die back every winter, but are kept alive from year to year by the underground root system. Roots of prairie plants can by longer than the plant is tall. The roots of big bluestem may be 7 feet long, and switchgrass roots can be 11 feet long. Two-thirds of most prairie plant are below the ground. Some roots die each year and decompose, adding lots of organic matter to the soil. That's why the soil of prairies is so fertile. Before settlers moved west, the prairies were covered with herds of grazing animals, such as buffalo, elk, deer, and rabbits. These animals increased the growth in prairies by adding nitrogen to the soil through urine and feces, and creating open areas for plants that like to have the soil dug up. Prairie dogs dug huge underground tunnel systems which aerated the soil and allowed water to reach several feet below the surface. Today very little of the original prairies survive, only one to two percent. Much of the land has been turned into agricultural uses, urban areas are moving in, and fires are being suppressed. The genetic and biological diversity of the plants are disappearing. The herds of thousands of buffalo were all but wiped out. There is a strong movement to educate people about prairies. Many states are rehabilitating what is left of their prairies and reintroducing the native wildlife and plants. Please visit our image gallery of the prairies. "Prairie Portrait", http://www.ag.usask.ca/exhibits/walkway/plains/portrait.html, (June 2001). "Prairie Climate", http://www.ag.usask.ca/exhibits/walkway/plains/climate.html, (June 2001). 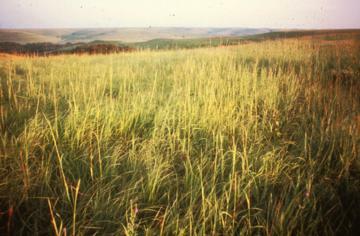 "Tallgrass Prairies of Illinois", http://www.inhs.uiuc.edu/~kenr/prairiebiodiversity.html, (June 2001). "Prairie Grass Cultural Guide by Prairie Frontier and photos" , http://www.prairiefrontier.com/pages/prairegrs.htm, (June 2001). "The Grassland Biome", http://www.richmond.edu/~ed344/webunits/biomes/grass.html, (June 2001). "Tallgrass Prairies of Illinois", http://www.inhs.uiuc.edu/~kenr/prairieintroduction.html, (June 2001).